I know we all have our favorites, etc. I know, again, that guys always emerge. But it feels like this year more than the past few years, fewer truly valuable devy prospects emerged. Fewer dominant freshman seasons, fewer 5* hype machines taking off. Maybe it's just me, maybe I've been too focused on the 2014 and 2015 draft classes the last couple years in a 1-round devy league. But there just isn't a ton of potential stud devy players out there that I'd be excited to draft right now. And that's added on top of the fact that it's already a crap shoot, all the time. I wrote about this recently. Last year there was ONE true freshman RB to eclipse the 1000+ yard rushing barrier (Alex Collins). As of a couple weeks ago, SEVEN backs have already accomplished the feat this season: Nick Chubb, Royce Freeman, Samaje Perine, Jarvion Franklin, Marlon Mack, Nick Wilson, and Justin Jackson. I'm not going to say all these guys are great prospects because they're not, but IMO this is a bumper crop of freshmen RBs, headlined by Chubb, Freeman, and Perine. That's without getting into backs like Demario Richard, Dalvin Cook, and Stanley Williams who have also done some good things. The 2016 class doesn't look quite as strong, but Alex Collins and Kareem Hunt have been solid. Others like Ezekiel Elliott, Thomas Tyner, Corey Clement, and Greg Bryant have the potential to become decent prospects. I wouldn't rate any as top 60 NFL draft picks right now. 2016 has a couple of good TEs in Hunter Henry and Bucky Hodges. Where I'm struggling to find awesome talent in 2016 and 2017 is at WR. I think it's pretty thin there. You've got a handful of interesting prospects like Laquon Treadwell and Speedy Noil. Then what? Some names like Pharoh Cooper, Rashard Higgins, and Artavis Scott. Interesting prospects, but not guys I'd really go to bat for right now. Ultimately though, I don't see a drought. I've been doing devy drafts for years and it's pretty typical to have a tier of 3-5 likely top 40 NFL draft picks followed by a tier of "maybes." If there are maybe 5-6 first round RB/WR total in an average draft class, I'd say maybe 2-3 of those guys will usually be identified as solid first round prospects prior to their final college season. That means you have 2-3 strong picks at the top of a typical dev draft, in addition to maybe 1-2 "false positives" like Woods/K Allen/Seastrunk/Lee who are initially overrated and eventually see their stock slide. This year is consistent with that. In a devy draft where everyone is available, you'd probably see Chubb, Perine, Freeman, and maybe Treadwell in the top 5-6 picks. Then a big cluster of maybes. Some of those maybes will become Jeff Fuller and Brandon Coleman. Others will become Mike Evans and Doug Martin. I don't think the pool lacks talent though. I have some mid-late devy picks this year and I anticipate having some good options. Elite locks? No, but you really can't expect that outside the first 2-3 picks, if that. You're curve-fitting based on 14 data points. And you're also missing (as you did the last time we had this discussion) the nature of the sampling pool. How many QB prospects at the combine had BMIs significantly lower or higher than your range? The answer is: Not many. So you have a major sampling bias. It's like in the FBG contest, concluding that 18-man rosters are the best because there's more of them left than any other size, when almost half of the original entries had 18-man rosters. It's absurd to make a statistical conclusion based on body size from that sampling. Players are individuals and they'll be assessed and successful based on their own qualities, not based on whether their body is close to the same size as Blaine Gabbert or Ryan Tannehill. That's one way to look at it. The other is that there have been hundreds of quarterbacks to come through the college ranks in the last 10+ years and the NFL hasn't seen fit to spend a first round pick on anyone outside a very narrow range of body types. You can find examples of skinny RBs who went high in the draft during that period (i.e. Spiller or CJ2K) or smurfy WRs (i.e. Brandin Cooks or Tavon Austin), but the NFL's front offices haven't shown any interest in spending premium picks on skinny QBs. They seem to have a very clear preference for bigger QBs. 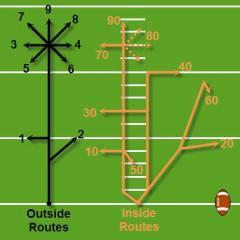 In fact, they seem much more discriminating of body type at this position compared with RB and WR. If anything, physique is MORE important for a QB than for those other positions. I think your argument is pretty flimsy. Almost like someone saying that even though no point guard below 5'10" has been drafted in the NBA's lottery in the last decade, height isn't an important consideration for NBA teams evaluating point guards. How many point guards have been drafted in the lottery in the last 10 years? I don't really know. Maybe 25-30? That's a small sample size, but not really when you think about it. In that time there have been dozens and dozens of good, but undersized point guards who were passed over. Why? Because NBA teams don't draft point guards below 5'10" in the lottery. Just like how NFL teams don't draft skinny QBs in the first round. They've had plenty of opportunities to do so. They just haven't done it. Why? Because they don't think someone with that body type can fulfill the job requirements. Since you want to bring up the past, let's remember the last time you planted your flag in the ground about a Pac-12 QB: ***Official*** Andrew Luck is overrated thread. I would say you were thinking with your heart and not your brain in that case. It seems like you're doing the same thing here. You're a Cal fan and Goff is a good player for Cal, but I think you're overlooking a pretty legitimate concern here. I don't think 12 pounds plus or minus on a true sophomore QB has anything to do with his pro prospects. And I haven't even said he's a pro prospect; he's shown some skills but he hasn't put it all together yet. He needs to be great at throwing the ball and making decisions, just like any other pro prospect QB. Could you give me a list of all the college QBs who were great at throwing the ball and making decisions, who failed because they had a BMI under 27 at age 19? Where are the "plenty of opportunities" NFL teams have had to draft QBs like that, that they've passed over? Do you think NFL GMs would rather have a QB who's 6'4", 210, or one who's 6'0", 210? Let's envision two different 2015 seasons for Goff. In Season A, Goff improves in all passing stats, going 350/500, 4250/40/7, for 8.5 YPA, going 9-3 as a starter and beating Oregon or USC. 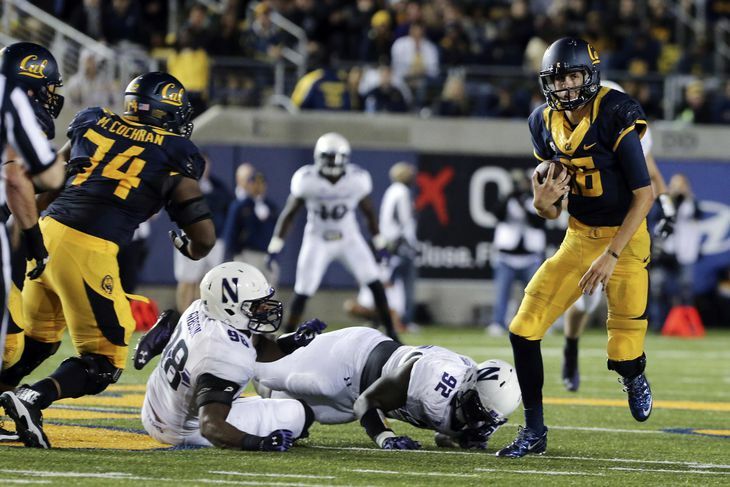 Cal goes to a good bowl game and wins. At the end of the season, Goff is still 6'4", 210. In Season B, Goff plays about the same as he did in 2014, going 300/500, 4000/35/7, goes 5-7 as a starter and misses a bowl game. He also gains 15 pounds. Do you think he'd be a better prospect after Season A or Season B? I'd go with B. NFL teams seem much more forgiving of physically talented QBs with suspect college production vs. college overachievers with suspect physical ability. Look at where physical prodigies like Jake Locker, Matt Stafford, Kyle Boller, Jay Cutler, and Blaine Gabbert went in the draft compared with college mega stars like Colt Brennan, Ken Dorsey, and Dennis Dixon. You see plenty of guys with great tools and "meh" stats go in the first round, but never the opposite. I've always felt that drafting QBs based purely on physical traits is a big mistake. The Gabbert/Boller/Locker/Cutler types who don't consistently dominate in college never seem to become elite NFL QBs. In that sense, physical tools are overrated. They aren't sufficient to make someone a great QB. The question is are they necessary? I think so. The fact that almost all high QB draft picks and successful NFL QBs fit within a narrow range suggests that there's a "right" body type for a QB, approximately between a 27.0-29.5 BMI. For whatever reason, players outside that range don't seem to become elite QB prospects or dominant NFL QBs. So to answer your question, I'd rather have a college QB with merely "good" production and the right physical traits than a college QB with "great" production and deficient physical traits. Generally speaking, the Andrew Luck types who have both are the best bet. But after that, the Jay Cutler/Matt Stafford types who have some QB skills and A+ physical traits are a better bet than the Colt Brennans who were rock stars in college, but don't have the requisite tools to translate their game to the NFL. Once again: Your logic here is completely fallacious. It's like saying that Colin Kaepernick won't succeed because he's the only starting QB who's ever had an "ae" in his last name. It's pretty clear that height is an advantage for a QB, and it's not at all clear that weight is an advantage. The reason why there aren't a lot of 6'4" 210 pound QBs in the NFL is that there aren't a lot of talented 6'4" 210 pound QBs to choose from. You haven't managed to name one yet. Can you guys start taking this to personal messages? 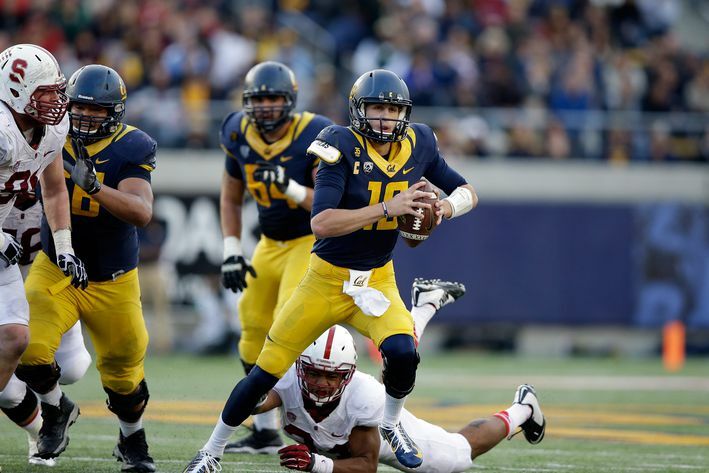 I care much more about the rest of the prospects than Goff from Cal. But I keep checking back in this thread to be disappointed. Name has nothing to do with performance. Height and weight influence performance. There are plenty of good skinny quarterbacks out there. NFL teams just don't use high picks on them. Colt Brennan and Ken Dorsey had great college careers. They were late draft picks and they washed out of the NFL without making much of an impact, probably in large part because they didn't have the requisite physical tools. I'm not going to waste a lot of my time debating this, but Goff is really skinny right now. If you think that's not going to influence his draft stock regardless of his other qualities then you're living in dream land. Another thread ruined by this BMI crap. That picture is from September 1, 2013, when Goff was an 18 year old true freshman starting his first-ever collegiate game. He's heavier than that now. He'll be heavier than he is now next year. His weight will not be at all an issue in his draft status; whether he continues to improve as a QB will be. Good post in response to mine EBF, thanks for your thoughts. I think the problem is that I'm skeptical of investing in most RB's that are that far out from being draft eligible, unless they truly look special and freakish. Chubb fits that description, like Henry did last year, and Gurley before that. Gordon to a degree as well last year. Ohio State sophomore QB Cardale Jones completed 12 of 17 attempts for 257 yards and three touchdowns in the school's 59-0 win over Wisconsin. Jones is considered OSU's No. 3 quarterback, but he has quite the downfield arm. He is obviously not as mobile as Braxton Miller or even J.T. Barrett, but Jones can move in the pocket and attack vertically when given time to throw. The blowout win could propel OSU into the CFB Playoff, and it makes you wonder if Jones will transfer in the hopes of starting somewhere else. Alabama sophomore RB Derrick Henry rushed for 141 yards and two touchdowns on 20 carries in Saturday's win in the SEC Championship. After putting up 100+ yards rushing in two of Alabama's first four games, Henry hadn't gone over that mark since late September. He finally broke through when it mattered most, repeatedly busting long runs on Missouri and ending the day with 20 carries (to starter T.J. Yeldon's 14) and 141 yards. Henry is a physical monster at 6-foot-3, 238 pounds. His combination of physicality and speed should see him with an increased role in his junior campaign. In his workouts, he flips monster truck tires, so there you go. Oklahoma sophomore RB Keith Ford rushed for 90 yards on nine carries in Saturday's 38-35 loss to Oklahoma State. Ford had to fill in for freshman Samaje Perine after Perine was felled by an ankle injury in the third quarter. He did a serviceable imitation, with over half his yards coming on a 56-yard scamper. The sophomore has been Wally Pipped a bit after suffering a foot injury in September, as Perine exploded onto the scene during the former's five-game absence and did not relinquish the starting role. Coming into the season, Ford was considered by many to be the Sooners' best runner. NFL.com's Gil Brandt called him a "future star" over the summer. With less competition, he'd probably have more breakout potential. He ends his season with 383 yards and five touchdowns on 67 carries. Oklahoma freshman RB Samaje Perine left Saturday's game against Oklahoma State with an apparent ankle injury. Perine suffered the injury in the third quarter. At the time, he had already rushed for 152 yards and two touchdowns on 26 carries. He was part of a stretch run to the right and fumbled the ball when he was hit. After the play, he writhed around the ground in clear pain. He was later seen on the sideline with a wrap around his left ankle before limping to the locker room for further treatment. Perine recently broke Melvin Gordon's FBS record for rushing yards in a game when he rolled for 427 against Kansas. Lot of good freshman RBs, but Nick Chubb is averaging 3.3 yards after contact, 2nd best among Power 5 players with at least 100 carries. Scout Inc.'s Steve Muench and Kevin Weidl believe Ole Miss sophomore WR Laquon Treadwell has "an explosive athlete with outstanding size and a wide catching radius." "While he can continue to add polish to his game, he is a physical route-runner who is a matchup nightmare with his strength, body control and leaping ability to win in one-on-one contested situations," noted Muench and Weidl. "Treadwell had his season cut short by a gruesome broken ankle against Auburn, but assuming he makes a full recovery, he has tremendous upside with rare physical tools that can't be coached." The 6-foot-2, 229-pound Treadwell, the No. 10 overall player in the 2013 class, might be the most talented receiver in college football. We hope he doesn't lose anything in his rehab from the aforementioned ankle injury. Notre Dame HC Brian Kelly told reporters freshman WR Justin Brent is in his doghouse. "Brent's an interesting kid," Kelly began, adding the receiver "gets distracted easily." If you would like details regarding what (or who) is distracting Brent, a simple google search will help. We suggest not doing so at work, however. Brent was considered a top 100 recruit by multiple services but has not cracked ND's receiver rotation in his first season. CBS Sports' Rob Rang believes LSU freshman RB Leonard Fournette "sports an NFL-ready frame and explosive speed." "The 6-foot-1, 230 pound Fournette was widely regarded as the elite prep talent in the country and he's certainly showed why in this contest, rushing for 143 yards on just 11 carries. Fournette sports an NFL-ready frame and explosive speed but won't be eligible for the NFL until 2017," Rang wrote. The true freshman also took a kick back to the house, scoring two touchdowns in Tuesday's 31-28 loss to Notre Dame in the Music City Bowl. Fournette was named to the SEC All-Freshman team after rushing for 891 yards and eight touchdowns on 176 carries. That Rose Bowl was the best I have seen Thomas Tyner look in a while. Helps repair his stock after a disappointing regular season. Some good performances from the youngsters in today's bowl games. Corey Coleman, Darren Carrinton, KD Cannon, and Dalvin Cook (besides the fumbles) all stepping up. De'Runnya Wilson also with a big game yesterday in a losing effort. Yeah, Tyner looked good. Also thought Karlos Williams looked better than I'd seen him all season too. He may not be super agile, but he's got good hands and respectable power. He's a day three pick, but I think he'll carve out a role on Sundays. Big De'Runnya Wilson fan right here. He stuck out early this year, even with only a few catches. Not a bad day for Ezekiel Elliott either. Sitting on 230 rushing yards with a little time to spare. Oregon true freshman RB Royce Freeman had 12 carries for 44 yards and a pair of touchdowns in Thursday's 59-20 romp over Florida State in the Rose Bowl. Freeman, the Pac-12's freshman offensive player of the year, wasn't needed as much as had been anticipated against Florida State's hemorrhaging defense. The 6-foot, 229-pound true frosh, often compared to Jonathan Stewart, finished his first year on campus with 1,343 rushing yards and 19 total touchdowns. NFL.com's Daniel Jeremiah and Fox Sports' Bruce Feldman both believe Freeman will translate well to the next level. So do we. Ezekiel Elliott won't be overshadowed anymore. Elliott, a sophomore, was fifth in the Big Ten in rushing with 1,402 yards. But given the incredibly strong group of tailbacks in the Big Ten -- Wisconsin's Melvin Gordon, Indiana's Tevin Coleman, Nebraska's Ameer Abdullah, Minnesota's David Cobb and Michigan's State's Jeremy Langford -- Elliott never received any attention. That will change for two reasons. The first is that the aforementioned quintet will all be in the NFL next season. The second is that Elliott is really, really good and should be incredibly productive next season. He ran over, through and around Alabama on Thursday on his way to his career-high 230 yards, which came on just 20 carries. Elliott was a high school sprinter of some renown in St. Louis and showed off his speed on an 85-yard TD run that proved to be the difference in the Sugar Bowl. But Elliott (6-foot-1, 220 pounds) also is a tough between-the-tackles runner who isn't afraid to stick his head in there and grind out a few yards. Ranked higher than Chubb in Rivals rankings. Just goes to show that rankings aren't everything. By the way my friend name is Glenn, he was a coach and Scout for The Dallas Cowboys. I'd take his evaluation as credible. Sony IMHO will be a HUGE name soon. If you can grab and stash, do it now. I recently went back and looked at the top 100 RB and WR recruits from ESPN over the past 8-9 years. From what I recall the percentage of players who go on to have an even moderately relevant NFL career is about 5-8%. Even if you just look at the top 10 recruits at each position, there are far more busts than hits. So while high school rankings aren't completely irrelevant, they aren't a great predictor of NFL talent either. What happens on the field in college is far more meaningful. From what I saw this year, Michel looked to be merely a decent prospect. Seems to have pretty good agility and movement. Not much of an athlete though, with just average size and speed. He's not a guy that I'd be looking at in a dev draft right now. He'll get more carries next year and your view will change. Give him more carries and watch him bloom. He will probably be a complementary player behind Chubb for the next two seasons. Unless Chubb gets hurt, it will be hard for him to really blow up. I don't think he's devoid of talent, but he's not on my short list for any of my single round 2015 devy drafts. I respect that, don't agree but that's why we play this game. I maybe the only one on the Sony train right now but that will change and again I'm a Huge Chubb fan, honestly.....I wish I can grab both in my Devy Draft after next year and I probably will. Ohio State sophomore RB Ezekiel Elliott says that he's "way better now" than he was at the beginning of the season. The 6-foot, 225-pound Elliot rushed for 230 yards and two touchdowns on 20 carries in the school's 42-35 win over Alabama. In his last two outings, Elliot has totaled 450 yards on the ground and has rushed for 1,632 yards and 16 touchdowns in his sophomore season. The Buckeyes prospect was the first RB to rush for 100 yards against the Crimson Tide all season, and he achieved that in the first quarter of the Sugar Bowl. Anyone have thoughts on Thomas Duarte or De'Runnya Wilson? He has talent just like Byron Marshall, Keith Marshall, DJ Foster, Kenyan Drake, Corey Grant, etc. has talent. But what does it mean on a grand scale? The question to ask yourself is "Do you see him being a significant contributor in the NFL for fantasy?" My answer is no. He reminds me Joe McKnight. Looks like a kick returner running the ball. To get an idea of how low I am Michel, I'd rather have Stanley Boom Williams over him. Williams looks more of RB with his vision, patience, strength, and he's got the same speed as Michel. Duarte played WR in high school, but some of the recruiting services (ESPN and Scout.com) listed him as a TE when he signed with UCLA. That's where I had him on my early watch list last year. I think he might have been listed there last season, but now they have him as a WR. Either way, he is too small to play as an in-line TE and would only be a Jordan Reed type there. He might look like a beast on paper when you see the height/weight and the yards per catch. I'd caution that he worked almost exclusively out of the slot and did most of his damage as a seam threat against nickel corners, linebackers, and safeties. He is player worth monitoring, but I'd tentatively peg him as a WR/TE tweener whose best chance of success in the NFL would be as a Jordan Reed type and not an outside WR. Wilson will probably have a high ADP in offseason devy drafts. A lot of people like him. He is a tall and lean jump ball receiver. People will compare him to Kelvin Benjamin, but he isn't that thick. I don't know if his speed and overall movement skills are good enough for the NFL level. Then again, I had the same questions about Mike Evans and Kelvin Benjamin. I mostly agree with that. I think Michel might be a little more talented than Joe McKnight, but he doesn't pop off the screen ala Chubb, Gurley, etc. I think your overall take that he's going to be just another body in the NFL is pretty accurate. He will probably make a pro roster. I don't see him blowing up though. Stanley Williams is a really good player. Super athletic. He is a very clean runner with excellent quickness. If he were just a bit faster or bigger, I think he would be a strong prospect. I think he's a player to monitor, but barring significant physical development, he might top out as a mediocre Thomas Brown type of prospect. Not quite fast enough to win with speed. Not quite big enough to win with power. Duarte looks to be similar to Devon Cajuste. A tweener that his college team won't know what to do with him. Glenn Smith is a friend of mine and he swear this kid is one of the best he's ever coached. I'm gonna cast my lot with Glen! He's personally worked with Pro Players, College, and high school all American.....to each his own. I'm sticking with Sony. Just updated some stuff to catch up with the 2014 season and if Keith Marshall's knee is right my estimate of his fall in the draft due to his limited role and injuries is about 2.5 rounds. IOW if he'd been a mid-2nd rounder under ideal conditions, he'd fall to the 4/5 turn today. If he comes out, runs well and is healthy I think someone will take a shot on him in the 4th. Assuming he's healthy by the combine this year, I'm not sure he's going to improve on that a whole lot running behind Chubb next year. So many experts on this board, I don't know which one to cast my lot with I can't believe some of these guys aren't working for an NFL team by now. I feel truly privileged to have so much information at the tip of my fingers. Thanks guys. Interestingly enough, UGA was favoring Michel to Chubb earlier in the year. They must have seen something in him to do so. I think Chubb has always looked better personally, but still. That's something. Right now he looks small and seems to play a bit small. Doesn't run through contact as well or break tackles with the regularity of Chubb and Gurley. That's not exactly terrible. Those are tough guys to comp vs.
Calvin Ridley is already 20 years old and will be an incoming Freshman for Alabama. He'll finish his first college season at age 21 while Amari Cooper will finish his first NFL season at age 21. Leonard Fournette will be the second best RB on his own team in 2015.